The Electronic Heat Interface Unit Ether is one of the new generation of HIUs, using electronic stepper motor controls. It is designed to deliver very low central heating loads under 5kW while maintaining low primary return temperatures. In addition the twin wall DHW heat exchanger provides complete protection from cross contamination in the case of a plate failure. 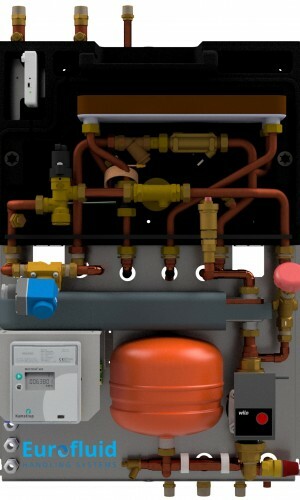 The Heat Interface Unit Ether provides an option that can be setup during commissioning to keep the Domestic Hot Water up to temperature continuously, or to allow it to go cold after 1 hour of inactivity. This option is desirable when the heat loss of the Heat Interface Unit Ether and its pipe work is greater than the perceived down-side of a longer delay during the first morning, or evening draw-off. 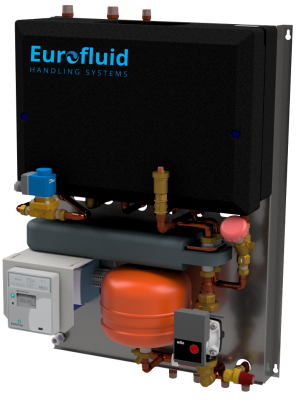 The Heat Interface Unit Ether uses an electronically controlled valve and flow sensor. During hot water demand the flow sensor will detect the draw-off rate and convey this to the electronic control. This ensures optimum opening of the valve, thus obtaining a water temperature of 60C. While hot taps are running the system provides hot water priority, closing off the supply to the central heating. When tapping stops the heat supply resumed to the heating circuit. As an optional extra The Heat Interface Unit Ether can be fitted with an industrial 8 port Ethernet switch, to establish a LAN across the site for use by billing and monitoring services. This is to provide a lower cost and more robust alternative to using GSM mobile connectivity and the increased traffic capabilities enable high resolution remote monitoring to become an option, without incurring significant increases in data costs.